(Johns Hopkins) viii + 291 pp. Reviewed by Carolyn Dever on 2018-04-06. Was she or wasn't she? Radical subverter of gender and class relations, or arch-conservative doyenne of the English countryside? Spinster dull as dishwater, or canny social sophisticate? Poster child for Tory respectability, or icon behind roller derby queen "Stone Cold Jane Austen"? To these questions Devoney Looser--aka, "Stone Cold Jane Austen" herself--replies yes, and more. In Looser's dazzling and capacious book, Austen emerges as the construct she has needed to be on any given occasion. "She was not born," writes Looser, "but rather became, Jane Austen" (1). Each historical period, each mode of adaptation, gets the Austen it deserves. Looser's Austen is a cultural phenomenon: less the woman writer who died in 1817, more a mirror of history, reflecting the instabilities of meaning that have charged important concepts such as "woman writer," "marriage plot," and "politics" over the two centuries and more in which Austen and her work have enriched the historical record, literary and otherwise. Following the invention of "Jane Austen" as a cultural icon wheeled out to serve wildly divergent causes across two centuries, Looser deliberately takes the "back roads" (10) to tell her Austen story. She seeks the uneven, unwieldy, messy, and often lowbrow Austen rather than the author canonized by the "prevailing cultural gatekeepers, by relatives or literati" (10). Wickedly fun to read, Looser's book engages us on every rigorously researched and documented page. It is also an important book. The Austen shaped by different media at different moments always offers new insights into the novels and their meaning. But even more importantly, the weaponization of Austen in diverse contexts reveals the stakes of engagement as well as her stunning capacity for adaptability, which is perhaps her greatest legacy. Looser turns a laser beam on Jane Austen as a para-historical figure. She foregrounds neither analyses of Austen's novels, nor their histories in critical and theoretical context, nor even their histories in adaptation, which as we know reach across a truly mind-boggling array of media. Nor does she do what many would welcome: show how novels such as Pride and Prejudice and Persuasion have fared in light of changing cultural and critical sensibilities over the years. The true significance of her critical intervention lies rather in the historical tale she weaves in order to complicate, infinitely and decisively, the concept of a single "Austen." In its place she reveals a cluster of Austens that tell us more about what any given moment and medium have at stake in the critical categories Austen represents. The staying power of Looser's book will spring from its rigor; at every turn, she resists the impulse to treat her occasionally arcane subject lightly. In probing a rigorous archive, the book suggests hundreds of new pathways and tributaries for future researchers. And its history is very much of the present. The book has its own website, which includes--a first in my experience!--a "Mantlepiece Classic" video trailer for The Making of Jane Austen itself. Is it churlish for a reviewer to admit being a tiny bit envious of an author clever enough not only to think of making a book trailer, but to do it? Perhaps, but at the same time the entire critical community should celebrate the creativity of a colleague who has thus embraced the pleasure of her topic, quirks and all. By finding joy in The Making of Jane Austen, Devoney Looser offers as powerful a gesture on behalf of the public humanities as any I have ever seen. Between a robust introduction and a coda on twenty-first century Austen, Looser's four sections treat Austen illustrated, dramatized, politicized, and "schooled," or translated into academic media. For a start, the introduction challenges contemporary assumptions that we have only now modernized Austen, only just invented the Austen of film adaptations or "girl-power feminism" (3). Instead Looser exposes an uneven but continuous history of significant social engagement with Austen and her legacy. "It sounds impossible," she writes, "but Jane Austen has been and remains a figure at the vanguard of reinforcing tradition and promoting social change. . . . Austen has been an inspiration, role model, and mascot for groups that have otherwise had little in common" (3). Looser chiefly aims, then, to retell the familiar story of Jane Austen from non-elite as well as posthumous viewpoints. She answers the questions "Why Austen? Why now?" by "turning to the history of [Austen's] afterlife, taking seriously the notion that past is prologue" (11). This story of author making begins with the history of Austen's nineteenth-century illustrators, who played a formative role in Victorianizing her novels. Jane Austen, Pride and Prejudice. London: Richard Bentley, 1833. Jane Austen, Pride and Prejudice. Illustrated by Hugh Thomson. London: George Allen,1894. So by the time Hollywood adaptations of Austen's novels were lending images to book jackets, earlier illustrators had fully established visual codes of interpreting them. "Artists' images of Austen's fiction," Looser writes, "have served to shape each generation's sense of her material and thrust, her tone and politics. These images inevitably propelled weightier conversations about her fiction and its legacy to wider audiences" (73). Austen's legacy in visual history extends from illustrated editions of her novels to dramatizations of the books, in all or in part, in drawing rooms and on stages and screens worldwide. Indeed, as Looser notes, "Jane Austen today enjoys far more viewers than readers" (75). In her richly informative analysis of Austen dramatized, Looser pinpoints the mid -1930s as the peak of her commercial and popular success in this genre. Publicity for the first film version of Pride and Prejudice (1940) even capitalized on its theatrical history. The less prominent history of Austen dramatized, however, must start with the fin de siècle "duologues" of Rosina Filippi, which put scenes and outtakes from scenes in Austen's novels into the hands--and mouths--of amateur actors, mostly women. Their performances recast Austen as a New Woman. "Romance is not at all the point of these dramatic texts," writes Looser. "Women's self-confident voices, in the face of domestic and familial conflict, are" (90). Since voices of this kind are epitomized by Elizabeth's rejection of Darcy's first proposal in Pride and Prejudice, Looser thoroughly surveys portrayals of him. Before he was played by Laurence Olivier and then Colin Firth, he was not only portrayed in a rich succession of pro- and anti-Darcy adaptations but was also played by women. In the 1920s and 30s, Austen herself was queered in Dear Jane, a bio-play by Eleanor Holmes Hinkley, when the director and actor Eva Le Gallienne cast herself as Cassandra Austen and her lover, actress Josephine Hutchinson, as Jane. Dear Jane, writes Looser, "puts forward a portrait of the author that veers sharply away from the stereotype of the perfectly pious Christian spinster. The play offers audiences the novelist as feminist flirt, testing and throwing over her male suitors. She actively chooses a writing life at the side of her beloved sister" (115). 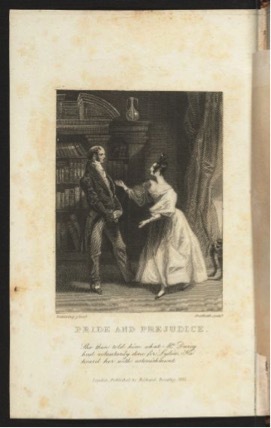 Yet the dramatization of Austen turned heterosexual again when MGM optioned Helen Jerome's Broadway adaptation of Pride and Prejudice. After many false starts, the exceedingly odd combination of Greer Garson and Laurence Olivier finally made it to the screen, leaving behind many other scenarios that did not. "These once imagined but never-made film versions," writes Looser, "demonstrate the dangers of our arguing that Austen was being repurposed for some kind of Hollywood-initiated ideological plot" (126). By the midpoint of Looser's book, Austen clearly becomes a figure of transference for the needs and desires of later generations: of those shaping her legacy within their own media of biography, illustration, stage, and screen. Who Austen was and what her novels mean are questions of interpretation. She is so endlessly adaptable that the stakes of adaptation seem to matter more than the novels themselves. As "a touchstone in institutions of the modern state," in Looser's words, Austen speaks across the political spectrum. "At signal moments of political debate in the past," she writes, "especially debates over gender roles, it sometimes seems as if everyone wanted to claim Austen for his or her side" (144). Austen was adopted not only by men's club conservatives but also by feminists, especially when suffragists proudly toted a banner emblazoned Austen's with name, dates, and a quill pen in the Great Procession of Women's Suffrage Societies held in London on June 13, 1908. Viewing her as both a "poster child" and a "problem child" for feminism (177), activists divided--and divide still--on how much quiet political intention can be found in Austen's work. This book prompts many questions. Is Austen a humorist on the level of the National Lampoon? A quiet, placid lady writer appropriate for the edification of schoolgirls? In contexts ranging from textbooks and study guides to penny novels and movies, Austen stood for education itself, for what it means to be an educated person. In Bollywood film adaptations, in zombie novels and fan fiction, and most notoriously as the cover girl for the new £10 note, "Austen's literary legacy proves," writes Looser, "that you can't both be a popular and a highbrow author in the way that Ronald Reagan proves that an actor can't become president. Holding the attention of scholarly and popular audiences alike is precisely what Austen has done through two centuries of images, stages, screens, schools, and soapboxes" (218). In this brilliant new view of Austen, Devoney Looser tells us as much about what we want and need from our literary celebrities as it does about "Aunt Jane" herself. Carolyn Dever is Professor of English at Dartmouth College. Leave a comment on Carolyn Dever's review.